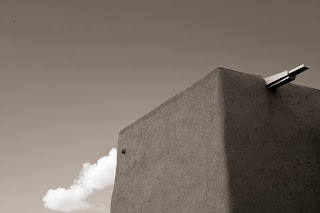 This image is more about shapes and spatial relationships than subject matter. But I do I like the way the solitary cloud directs the eye through the adobe and straight into the canale. It's like the canale is the hood ornament and the cloud is the exhaust. Steve, you've got me smilin' with this one. Nice series, but this one's the winner in my book. Funny, when I first looked I saw a rocket or surface to air missile. I had just listened to an interview with an Apache Helicopter Female Pilot about her tribulations and my mind was in that space. I love learning what folks respond to. Truth be told, I didn't fully appreciate the cloud to canale relationship till it was on the big screen. As you know, John, getting anything unique out of Ranchos Church is a tall task. I keep going back there nonetheless. Thanks to both of you for the kind words. John meet Lenny. Lenny meet John. Just to clarify, my friend Lenny used Larry's google account to post his comment. This is a very cool study in everything that is design and photography. It is indeed a winner.